Ladder safety is important to us at Rosenfeld Injury Lawyers LLC and our Chicago ladder defect attorneys have compiled the following safety tips to help prevent ladder accidents at home and in the workplace. In the unfortunate event that you are injured in a ladder accident and feel that a defective ladder was a major factor in the incident, we will be happy to review your case. 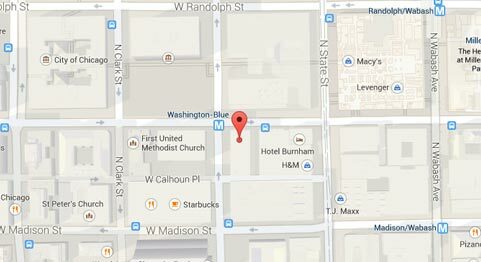 We have worked with hundreds of clients across Illinois and recovered the maximum amount of compensation the law affords. Consider the following ways to decrease your chances of being involved in ladder accidents. 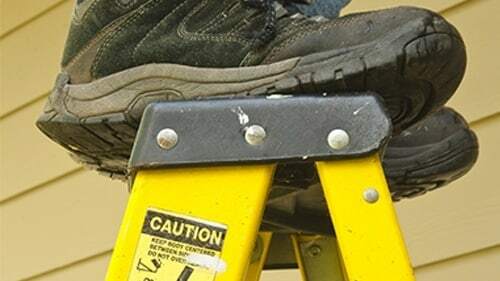 Wear shoes that provide traction, especially when working on ladders with steel steps, as many accidents result from users losing their footing in slippery conditions. Inspect your ladder prior to use to make sure it is in proper working order. If it has been exposed to the elements, check for signs of damage or wear. Never use a steel or aluminum ladder when working near electricity. The safe alternative is to use a fiberglass ladder as it is not conductive and reduces your risk of electrocution. Make sure that your ladder is not on an uneven or slick surface. To ensure you are on even ground, you can use a ladder level. Do not climb any ladder that has not been properly secured or if locks are disengaged. Do not share a ladder with another person as this could result in you or the other person being thrown from the ladder accidentally. Never try to move a ladder from an elevated surface as you are not assured it will be secured in its new location or on suitable ground. Always climb to the bottom and move the ladder from the ground. Do not make the mistake of attempting to carry objects by hand up a ladder, as this is a common cause of injury. Use a tool belt or conveyor. Having others hand tools up to you can be unsafe as well, as it forces you to lean and could affect your balance. Know your limitations and do not exceed them. Many people are involved in accidents because they attempt to reach too far or lean to the side, only to fall from the ladder or have it fall from under them. It is safer to climb down and adjust the ladder so that you can reach your intended area. Be mindful of adverse weather. Snow, ice, wind and rain all present fall hazards and you should avoid working on a ladder in any of these conditions at all costs. Do not stand on the top or second to top rung of a ladder as it is possible for you to lose your balance and fall. Always secure your position by keeping one hand on the ladder. This will also allow you to know your limits as you should not reach farther than is possible while maintaining a grip on the ladder. Do not skip rungs when ascending or descending from a ladder. You should never be in a hurry when moving up or down a ladder. Make sure you have enough clearance where you are working to avoid hitting your head. Carelessness is usually the result of hurriedness and it is important to remember that it is better to take your time than to take a trip to the hospital. On occasion, ladder accidents result from a defect in the ladder’s design or poor construction. When this is the case, you have the right to file a lawsuit on grounds of product liability to recover compensation for the payment of your medical bills and recovery of lost wages and other expenses. The Chicago ladder defect attorneys of Rosenfeld Injury Lawyers LLC have a proven record trying these cases and can maximize your recovery when filing a ladder defect lawsuit on your behalf. Contact us today to arrange a free consultation and case review and we will explain your rights and legal options and gather the information we need to perform a detailed evaluation of your case. From there, we can guide you on the next steps to take in order to pursue your case and let you know what you can expect throughout the entire process. Should we be unable to earn a court judgment in your favor or negotiate a settlement on your behalf, our services will be free of charge.